Bottom line: Learn how to get the pivot table to default to a Sum calculation instead of Count when the source data field contains numbers. 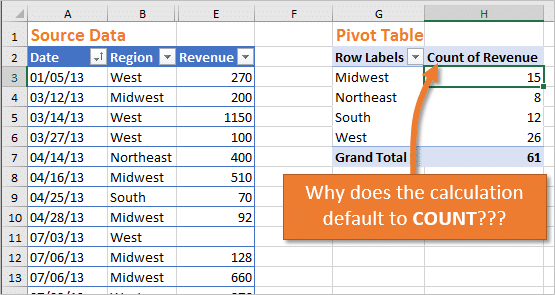 Why does the Pivot Table Default to Count? Well, Pivot Tables have some rules on which calculation type will be selected when we add a field to the Values area. If ANY cell in the column (field) contains text, blanks, or errors (#N/A, #REF!, #VALUE!, #NAME? ), then the calculation type will default to COUNT. If ALL cells in the column (field) contain numbers, then the calculation type will default to SUM. Now that we know the rules, we can prevent this error by cleaning up our data. Let's take a look at 3 ways to make sure the calculation type defaults to Sum. In the video above I show a data set that contains blanks in the Revenue column. Since there are blanks in this column, the pivot table calculation type defaults to Count. One quick way to fix this is to replace the blank cells with a zero (0) value. Here are instructions on how to find & replace all blanks in a column. Select all cells in the column or Table (keyboard shortcut: Ctrl+Space Bar). Open the Replace Window from the Home tab on the Ribbon in the Find & Select menu (keyboard shortcut: Ctrl+H). Delete everything in the Find What text box so it finds blank cells. Type a zero 0 in the Replace With box. Press the Replace All button (keyboard shortcut: Alt+A). Refresh the pivot table (keyboard shortcut: Alt+F5). Add the field to the Values area of the pivot table. The calculation type should default to a Sum calculation if all cells in the data source column are numbers. Blank cells are the most common cause that I see for calculation type defaulting to Count. However, cells that contain text or errors can also cause this problem. If the source data column contains a formula that is returning errors, we can use an IFERROR function to return a zero instead of the error. Of course we will want to determine why the error is occurring in the first place. My free 3-part video series on the lookup formulas has an entire video dedicated to learning how to prevent and fix errors with formulas like VLOOKUP and INDEX/MATCH. Sometimes values in cells look like numbers, but the numbers are stored as text. This is a common issue when you are importing data into Excel from another system. In this case we will need to convert the text to numbers first. Checkout my article on keyboard shortcuts to convert text to numbers to learn more about these techniques. At the end of the video I also explain how PivotPal can save time with this issue. PivotPal has it's own rules for adding a field to the values area, and does NOT default to count if the column contains blanks. If the column contains numbers and blanks, PivotPal will default the calculation type to Sum when we add the field to the values area using the PivotPal window. This is one way to get around this annoying issue without having to modify the source data. The PivotPal Add-in is packed with features that will save you time when working with pivot tables in Excel. Please click the link below to learn more and give PivotPal a try today. Right now my good friend John Michaloudis from My Excel Online has a pivot table webinar going on. 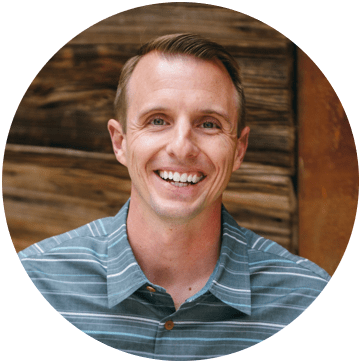 This is a free hour long training on how to get started with pivot tables in Excel. Click the link below to register for the free webinar and pick a time that works for you. What Other Issues Cause the Calculation to Default to Count? 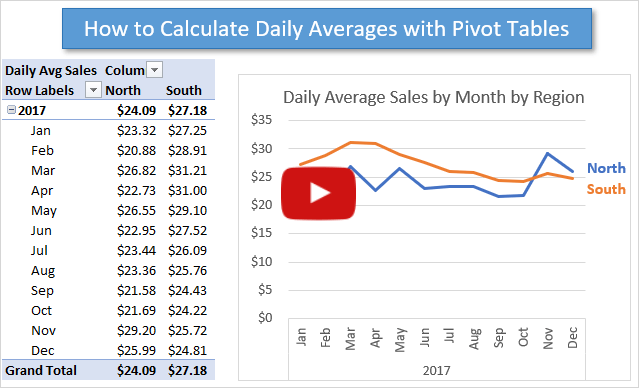 This article is a very helpful and well-assembled tutorial on solving this most intractable and irksome of pivot table issues that often pops up several hours in to assembling a complex report. Thank you very much for collecting and arraying all of this info in one single very useful source, most appreciated! Thanks Ian! I’m happy to hear you found it useful. Excel has a lot of little quirks like this that can be somewhat of a mystery sometimes. All of your videos that I have watch are very informative and easy to understand. You are really doing great service to all Excel users. Another Excel annoyance explained … thanks. I don’t know if you have covered this topic before, but tips on cleaning up a pivot table – e.g. formatting, fixing column width, etc. – would be helpful. This is useful. I had this problem a few weeks ago. Eventually, I identified the issues as having to do with blank cells, but didn’t go about fixing it. Thanks for nice feedback! I don’t know of an add-in for the Mac that does this. However, there is a fuzzy match add-on for Google Sheets. I have not tried it, but might be worth a shot. I hope that helps.